There are many different descriptions of the effects of alcohol on a drinker and on his or her family and friends. What is presented here is one of these models, based on the findings of current research and evidence. It takes into account the “two faces of alcohol” which seem to contradict each other. For adults as well as for young people, these “two faces” seem difficult to reconcile, so we try to make sense of this contradiction and to provide a holistic model (taking the whole person into account) for understanding alcohol. There are two sides to our experience of alcohol. On the one hand, alcohol is used on all sorts of occasions – weddings, births, graduations, parties, dinners, matches and even funerals. Some people use alcohol too to enhance days that are not particularly special like Fridays. The alcohol industry creates considerable employment both directly and indirectly and it's a major source of tax revenue to the State. On the other hand, alcohol is a factor in a great number of problems – accidents, fights, rows, headaches and heartaches, health problems and even deaths. Alcohol leads to increased absenteeism at work, reduced work performance and to increased costs in healthcare and admissions to hospitals. 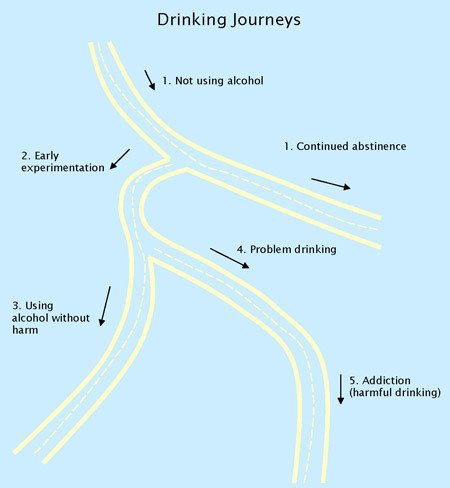 The interaction between a drinker and alcohol can be illustrated as a journey shown on a map. In the next few sections this journey is explored in more detail.